The Charka on which thread for khadi cloth was spun, and khadi fabric itself became symbols of India’s independence movement. You pull on clothes each morning without even thinking. Yet each piece of cloth tells a story-of where the materials it is made up of was grown or made and how it was crafted (shaped) into the garment (clothing) you are wearing. Some textiles have very special stories indeed. In this Special Report, we will track down some of these tales. When did people begin to wear clothes? Modern humans appeared on Earth about 200,000 years ago. Clothes appeared a long time later, around 100,000 years ago. How do we know this? Because a scientist in the United States (US), who was studying lice (yes those icky pests that you find in hair) discovered that lice that lives in clothing appeared 100,000 years ago and its logical to assume that these lice made an appearance when humans began to cover up. Scientists believe that humans began to use fur, leather, leaves and grass as clothes and this need became greater as early humans began leaving Africa for the cooler regions to the North. Over time, people became clever at spinning yarn and using tools like needles to craft clothes. Clothes continued to be made by hand for thousands of years. In India, weavers developed many kinds of beautiful cloth that became famous all over the world. 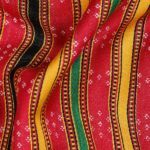 Indian cotton and fabrics were much prized all over the world. 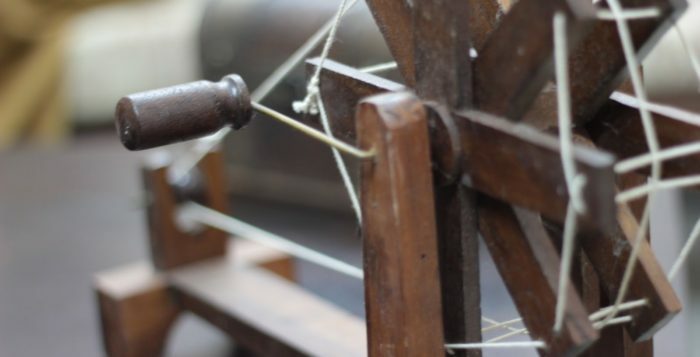 Things changed when the British invented machines such as the spinning jenny and cloth began to be mass produced (in huge quantities) in factories. Today, much of our clothing is produced in factories and shipped to shops all over the world. Luckily for us in India, we continue to have a tradition of cloth that is woven by hand using looms and there are many, many different kinds of weaves in India. Each of these is special to a region and a culture. 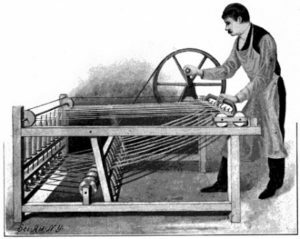 To make a fabric on a loom, the weaver brings together horizontal (sleeping line) and vertical (standing line) yarn (yarn is like thread) and weaves them together. The weaving pattern and the colour of the yarn together create the pattern and shapes-geometric shapes like squares and triangles or patterns of birds, flowers etc. 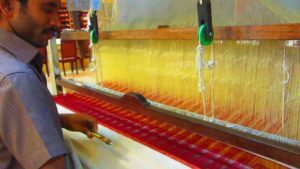 What makes Patola a complex (difficult) weave is that both the horizontal and vertical yarn is dyed in different colours. During the weaving, they must be matched in patterns to create the bird/flower/geometric shape design. Given that Patola designs are very intricate with lots of details, you can understand how very, very difficult this kind of weaving is! It’s not very different from designing computer software or creating an architectural design for a house. Khadi is perhaps the most famous of our Indian textiles for it is so closely connected to the freedom movement. 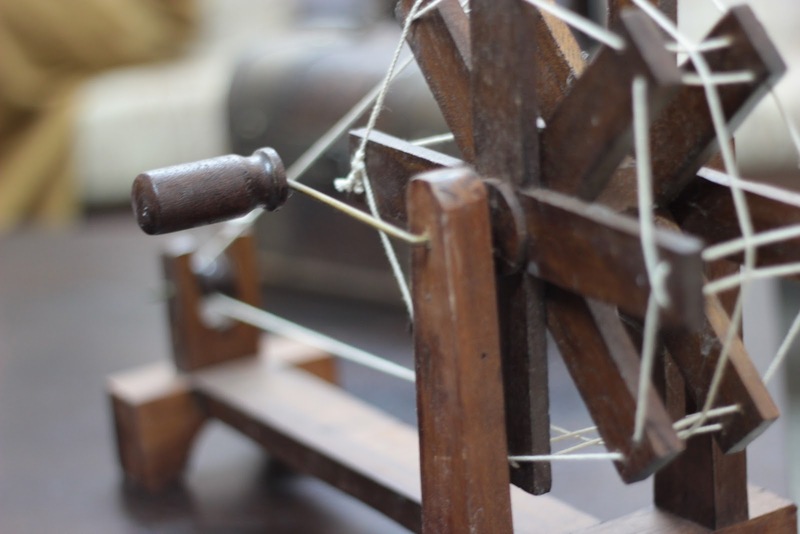 As part of his plan to get the British to move out of India, Mahatma Gandhi wanted Indian people to stop using textiles made in British factories and instead use hand-spun and hand-woven khadi. To this date, our political leaders wear a lot of khadi. Mashroo is a special fabric created for Muslims living in Gujarat who believed that silk should not touch a person’s skin. The fabric is woven in such a way that on the outside it has the shine of silk while the inside, the part that rests on the body is completely cotton! So technically, the wearer is wearing cotton next to the skin but the appearance is of a beautiful silken fabric. 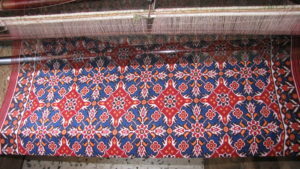 The port town of Mandvi in Gujarat is the centre for Mashroo weaving in India. Calico: Calico cotton takes its name from the Kerala town of Calicut where the fabric first came from. 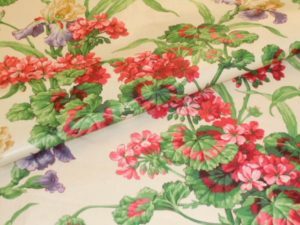 Chintz: Chintz was the word given to brightly coloured calico cloth made in India that takes its name from the Hindi word ‘chhint’ which in turn comes from the Sanskrit word, ‘chitra’ that means spotted or bright. Seersucker: Seersucker is a kind of cotton fabric that has a wrinkled appearance due to the alternate use of smooth and bunched up yarn in its weaving. The name comes from the Hindi word ‘sirsakar’ referring to milk and sugar. The double appearance of the cloth, smooth as milk in places and rough/bumpy like sugar in others, probably gave rise to its name. Up to now, the purpose of clothing has been to protect the wearer from heat/cold as well to make him or her look good. A new kind of clothing that comes in-built with technology is making our clothes even more useful. These new clothes have the ability to change, carry energy and even communicate. Sportspersons have really benefitted from these new high-tech clothes. Sportswear that can prevent the body from becoming too hot or too cold and control vibration (movement) of muscles is helping athletes perform better on the field. New kinds of chemicals are being used to coat the threads fabrics are woven from. These coatings can make the cloth repel (push away) water, stains and even bad smells. Electronics woven into the fabric will soon allow clothing to communicate with smartphones and other devices. Later this year, jackets will go on sale in the United States (US) that can be ‘programmed’ to connect with mobile phones through a simple touch of a sleeve. 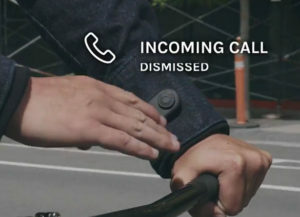 Users will be able to receive or silence phone calls, get directions and access their phone applications by just touching the jacket. And the good news-this jacket is even washable! New age clothing is not just for the future-it is already here! You can already buy T-shirts that monitor your basic health when you wear them-they keep track of the wearer’s heart rate and breathing pattern and even pass the information to a phone!